Loved my stay here! I literally showed up to sleep so I didn’t spend much time here but it was one of the most comfortable dorm rooms/beds I’ve ever stayed in. I still remember how soft the comforter was and the bathroom was perfectly clean. Kind of hard to not give this place a 10/10 rating! 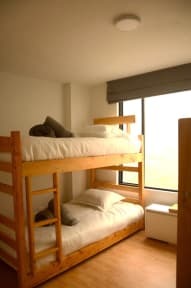 Located in a very clean and safe area of bogota with a lot going on! Staff right from the get go were very friendly and helpful. One staff member slept on the couch in the common area just to make sure she would hear me come downstairs it call me a taxi to the airport at 4am. Enough said. Excellent new Place in a clean and calm neighborhood with multiple food locations ridiculously close. 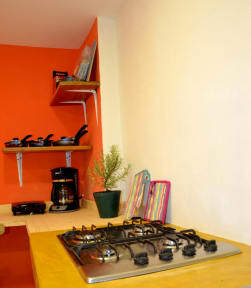 The food in the area is gourmet quality and the hostel fits right in without breaking the bank. Close ride to some good clubs and bars but nestled in a quite neighborhood. We had a private room with a key so there was no need for lockers. The beds were two queen sized mattresses (double beds) and were beyond comfortable. We also had our own tv and breakfast was very well set up. The staff at the desk was a very nice Chilean girl. The location is great and the mixed dorms have private bathrooms. The breakfast was okay but there are to many great options for food near by for that to be a problem. No complaints! I have mixed feelings about this hostel. On the one hand, it was really cozy, located in a great and safe part of Bogotá, had a great breakfast, and it was super affordable. On the other hand, the environment was a little strange. A lot of guests were actually people that lived there and there wasn't really much of a community vibe (although everyone was friendly). The terrace was cool but no one ever used it. Wifi was spotty but good enough that I could work. Pros: good location in Usaquen. Good value for money. Private showers in the room Bad: rooms are quite small.wifi signal not very good in the rooms. The staff had lots of washers and dryers sitting around doing nothing but would not offer laundry service to the guests. I had to take my cloths to a dry cleaner 15 blocks away and pay them 65,000 COP to do 1 load of laundry. A 24 hr staff should be able to offer laundry . The building is made of metal and you can hear everything going on. Not sure how often they wash the sheets but I never saw it. If you do stay here you must have an Empanada from the lady 2 doors down they are the best. Good location and staff were accommodating. Unfortunately walls were paper thin and hostel was very busy so therefore very noisy. Negatively surprised when arriving at the Hostel. Staff was smoking outside instead of helping guests. The kitchen was a mess (luckily got cleaned the next morning-but the first impression sticks). The rooms are small but ok-the power plugs attached to the beds don't function. Others are black burned so it was not comforting to use these. Breakfast was OK-not always available on time&bad Wifi. The Hostel had weird vibe due to unprofessional&inhospitable staff. The 9.5 rate is misleading.